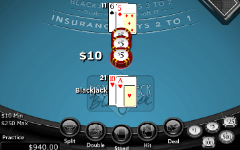 As both land-based and online casinos look for ways to increase their profit margins, blackjack variants nowadays are usually played with six or eight decks of cards, which seriously raises the house edge, thus further damaging the players’ chances of turning a profit in the long run. This is why taking some time to find gaming establishments that offer blackjack games that only employ one or two decks can pay off big time. And having already reviewed the single deck blackjack variants, it is time to turn our attention to double deck blackjack. The first thing you need to know about this particular variant of the Las Vegas classic is that there are not too many software providers offering double deck blackjack titles, with Double Deck Bovada and Double Deck Cryptologic some of the games at your disposal. The fact that only two decks are used and shuffled after each round significantly lowers the house edge, and it goes without saying that double deck blackjack gives players the best chance of winning with the exception of single deck games. The rules obviously differ from one variant to another, and there are some things you need to pay attention to. 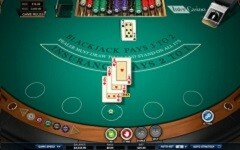 The most important rules are the ones you are already used to as Blackjack pays 3:2 and Insurance pays 2:1, but the main difference is that most double deck blackjack games have the dealer hit at soft 17, which is not the best case scenario, seeing that it increases the house edge by 0.2%. (There are exceptions, such as Bovada casino, where you get 99.76% payouts). Split Aces only receive one card and such Ace paired with a 10-value card does not constitute Blackjack. Up to three hands can be split in a row and there is no Surrender option available. There are several tips that will improve your overall chances when playing blackjack games where two decks of cards are used, besides obviously following the basic strategy like in any other blackjack variant. The first thing you need to do is try and find a game where dealer stands on all 17s as this format gives you a much better chance than those games that have the dealer hit at soft 17, which is basically an Ace and any combination of six. Another important advice we can give you is never to take insurance considering that it is another way that the casino can gain an extra advantage over the player, and it is not as if they don’t have it already. Make sure to also use double down and split options wisely as these can seriously improve your total balance if used correctly, so it can be smart to study the general blackjack rules as well as rules for individual blackjack games before you try to find a way to beat the house in their own game.